The flow of fluids along a boundary, such as occurs at the inner lining of vascular tissue, produces shear stress force. Fluid shear forces influence several developmental and pathological processes, including cardiovascular development and atherosclerosis. The lymphatic vascular system is a low-pressure, low-flow system that carries lymph through an intricate network of vessels to the venous system. As primary lymphatic vessels mature into collecting vessels, they develop valves that prevent lymph backflow. Daniel Sweet and colleagues at the University of Pennsylvania determined that proper flow of lymph is required to initiate the transcriptional program in lymphatic endothelial cells (LECs) that directs lymphatic vessel maturation. The authors took advantage of platelet receptor CLEC2-deficient mice, which have blocked lymph flow as the result of back-flow of venous blood into the lymphatic vascular system. While primary lymphatic plexis development was normal in these animals, the immature lymphatic vessels failed to develop into mature vessels or form valves. Expression of the transcription factor PROX1, which is required for lymphatic development, as well as other lymphatic markers were markedly reduced in LECs of CLEC2-deficient mice. In cultured human LECS, exposure to shear stress induced expression of genes required for lymphatic valve development as well as the transcription regulator GATA2, which was required for flow-induced changes in lymphatic gene expression. The results of this study identify lymphatic flow as an important mediator of lymphatic collecting vessels maturation. 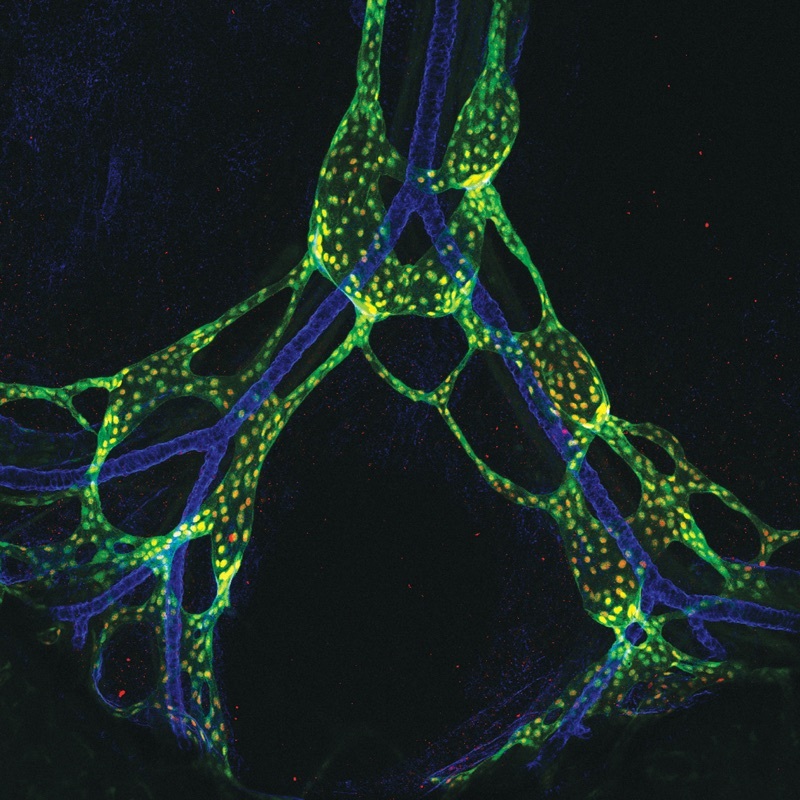 The accompanying image shows mouse (embryonic day 18.5) mesenteric lymphatic collecting vessels (stained for PROX1, green) in which lymphatic valves are marked by high expression of FOXC2 (red) and laminin alpha5 (blue). Laminin alpha5 also stains arterial basement membrane (blue). Read the accompanying Commentary “Lymphatic vessel development: fluid flow and valve-forming cells” by Tsutomu Kume and the related article “GATA2 is required for lymphatic vessel valve development and maintenance” from Jan Kazenwadel, Kelly L. Betterman, and colleagues.